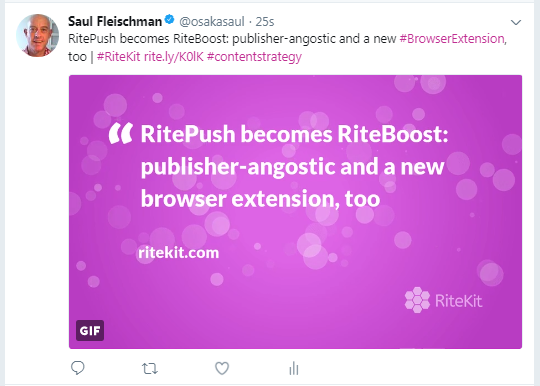 Get the RiteBoost browser extension to Enhance the Hootsuite main publishing field, and to do everything shown in the video below. Login and get the RiteBoost browser extension from the bottom of RiteBoost. In the main publishing field, paste/type your post with URL and hit the wand. NOTE: Enhance is not available from the three dots under any post in a Hootsuite column. Under the main update box: the wand does what you set your default Enhance Preset to do in RiteKit. 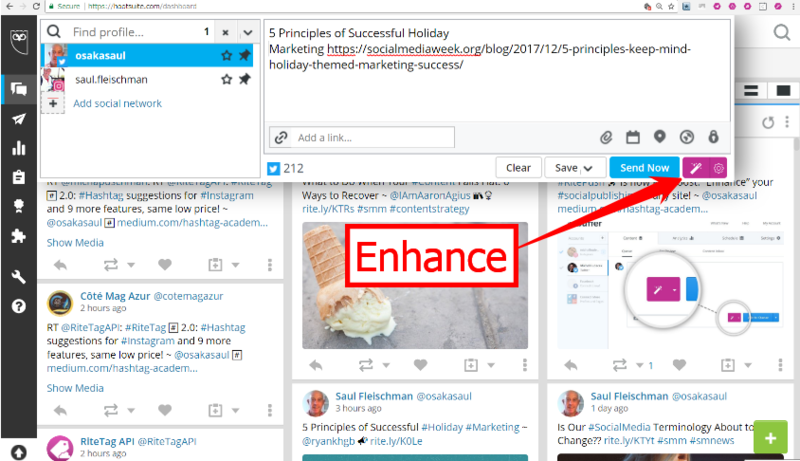 Or, you can compose your post in the Hootsuite main publishing field and right-click in the filed for your Enhance options. The gear beside the wand options options to select a different Enhance Preset or choose a different Rite.ly Link Ad, create a GIF from text and much more. Enhance is your solution for two relevant and reaching hashtags, and when possible, an image, too. 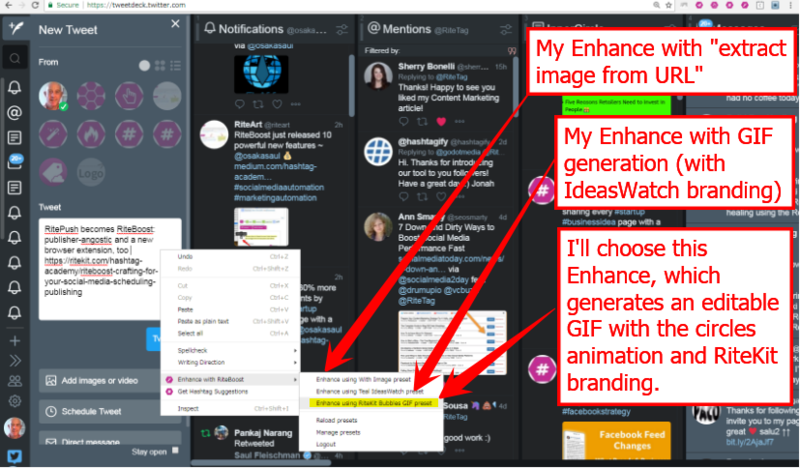 Create a quoted text image, attach and put "quote" marks around any three or more words and then select Send to RiteBoost and Enhance to create and add an image from your Image/GIF Templates. Add your self-branded Link Ad to pages shared with the ow.ly created by Enhance automatically by setting that up here (be sure to have the top two boxes ticked). More on Enhance is here. 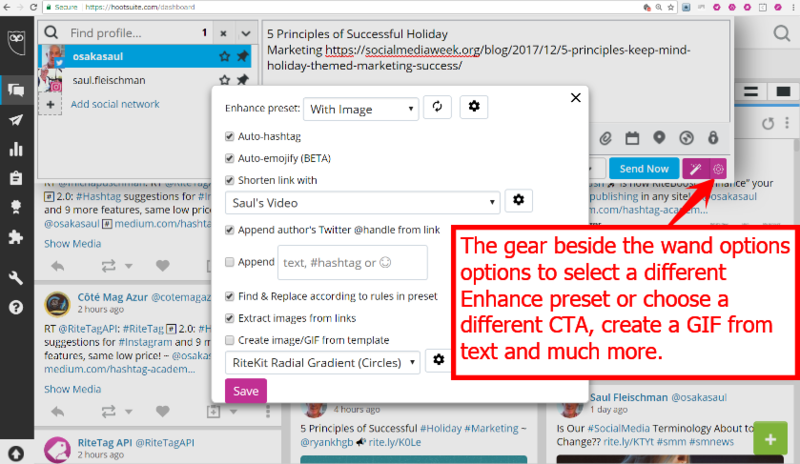 The RiteBoost browser extension provides a one-button social fix: two relevant and reaching hashtags, and when possible, an image, too. That's Enhance. I also show the power of using RiteBoost with Rite.ly (either Rite.ly Free or Pro), to embed your self-branded Link Ad or "call-to-action" (CTA) as video, image or text on pages you share. You can also use Rite.ly with Enhance and get your Link Ad baked into the URLs of pages you share. Rite.ly is the URL shortener with lots of analytic and a highly customizable appearance. Video Link Ads, text and image popups, sound effects and the ability to place the Link Ad in any of four locations on the pages you share in posts to social profiles. 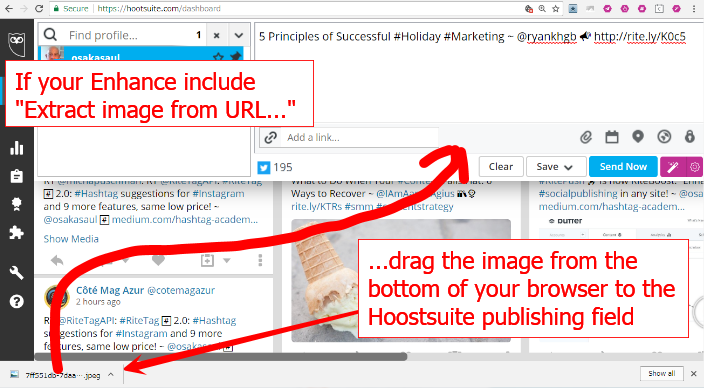 BONUS: your RiteBoost browser extension is not just for Hootsuite. 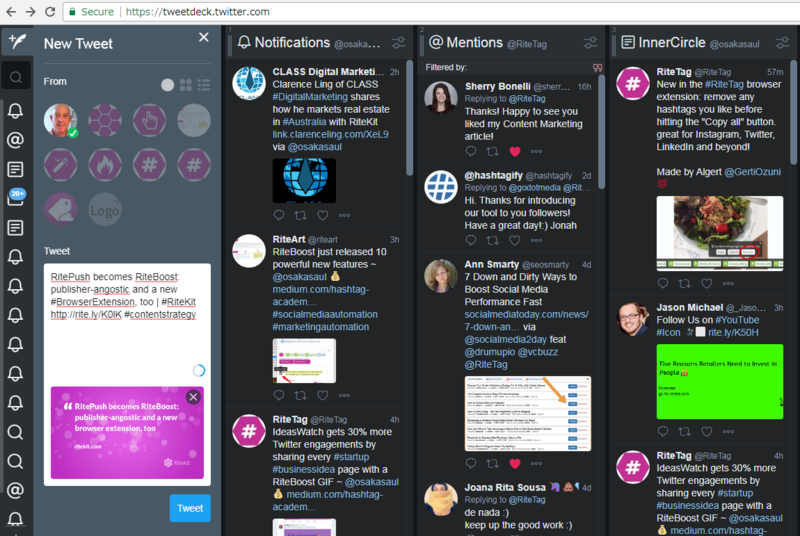 Enjoy RiteBoost in the websites and browser extensions of Sproutsocial, Buffer, Hubspot, Sendible, Facebook, Tweetdeck, Twitter, and in all sites that offer social media publishing via the browser extension. In most sites, you wont see the wand. Just get your post ready, then right-click and select Enhance with RiteBoost from the mouse options. PRO-TIP: Modify your default Enhance preset with "Extract image from link," but also create Enhance presets for clients, with their brand logo and color/font scheme GIF and also, at least one Enhance Preset with GIF template for your own brand.